A few years back, Charles Todd, the mother-son writing team in Delaware and North Carolina, started a new mystery series. Their Inspector Ian Rutledge series was highly successful, but they hoped that first-person stories with a young woman protagonist might attract some readers who find novels centered on the brooding Rutledge – struggling with what we now call PTSD after his World War I experiences – too dark. The new series also allows them to step back a few years and depict the Great War, even as they continue to portray its devastating aftermath in England so movingly in their original series. Here’s entry No 4. AN UNMARKED GRAVE. By Charles Todd. William Morrow. 262 pages. $24.99. It’s 1918, and a massive influenza has added to the already terrible suffering and death on the battlefields of the Great War – and at home. Bess Crawford, by now a seasoned battlefield nurse, is fighting exhaustion as she continues to help the seemingly endless stream of patients coming through the field hospital where she’s serving in France. Then she has another worry on her mind when an orderly draws her aside to show her one body among the many soon to be buried. Bess’ trained eye quickly confirms what the orderly has seen: This man is not the victim of flu or of battlefield action. He’s been murdered, and very recently, his body apparently hidden among the dead in someone’s effort to conceal the crime. What’s more, even though his insignia and uniform are gone, Bess recognizes the man as an officer who had served with her father, Colonel Crawford. Before she can decide what to do, Bess is felled by the flu. By the time she’s back in England recuperating, she doesn’t know whether her memory of the event is accurate or something from a fevered dream. Then comes news that the orderly who called the murder to her attention is also dead, reportedly having hanged himself. Everyone close to her urges Bess to concentrate on recovery and stay away from whatever happened in France. But Bess, though as gently reared as any proper young English lady, is also the daughter of an Army officer. She’s not going to let this mystery go unsolved, danger or no danger. As Bess travels back and forth between the front and England, trying to ferret out the truth wherever she goes, a shadowy threat hovers nearby. Despite her family’s efforts to protect her, Bess is nearly done in more than once, and people who might be able to identify the murderer become his latest victims. As always, Charles Todd offers a complex and believable plot that propels the story along, right to the heart-stopping climax. Bess is an endearing character, her actions driven by her strong moral fiber and sense of duty, yet tempered by her sympathetic, kind heart. The recurring characters and those who appear in this book only are complex and richly drawn. Those who like a well-plotted, well-written mystery with an engaging amateur sleuth will find all the ingredients for great vacation reading here. 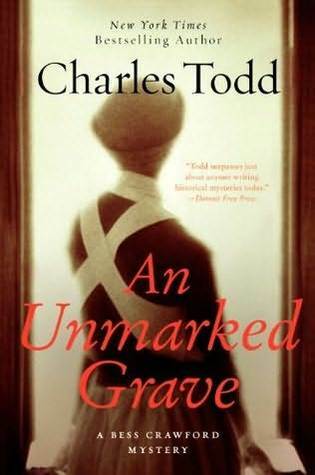 And, like all the Charles Todd novels of both series, An Unmarked Grave has much more to offer than a well-told tale. The authors have researched World War I and its aftermath extensively. They have also perfected the art of working their considerable knowledge and understanding into their stories naturally. Readers absorb the harsh realities of this first modern war and its profound effects on society without feeling that the authors are imparting a history lesson. In the Rutledge books, we see the early years after the war, when individuals and British society as a whole struggle to make sense of a changed world. In the Bess Crawford wartime books, we smell the gas, hear the guns and see the ravaged bodies and haunted eyes of the wounded. And though they aptly describe acts of courage and dedication, Charles Todd’s books do not take the easy route of romanticizing the war. In all these stories, characters have the heartbreaking sense that the war inevitably is helping to destroy the very way of life they fight to protect. Charles Todd has written another excellent book. This entry was posted in Historical Fiction, Mysteries and tagged Bess Crawford, Charles Todd, Mystery, World War I. Bookmark the permalink.